The Hereford is a British breed dating back to the 1700s, renowned for its excellent meat. 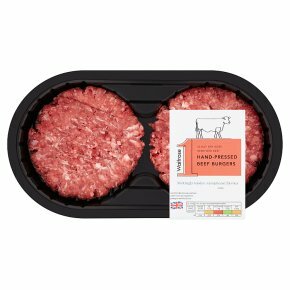 Hereford beef is finely marbled with fat, which makes the meat succulent and tender, and gives it a unique, rich flavour. Our Hereford beef comes from a small group of dedicated farmers, and is produced from cattle sired by registered pedigree Hereford bulls. The cattle live outside for most of the year, so they grow slowly. To bring out the best in the meat, our 30 Day Dry Aged Hereford beef is wrapped in muslin and hung on the bone in a carefully-controlled, dry environment. The ageing process makes it even more tender, and develops its characteristic rich, almost buttery flavour. Meltingly tender, exceptional flavour. Hereford beef produced from cattle sired by registered pedigree Hereford bulls. The Hereford is a British breed dating back to the 1700s, renowned for its excellent meat. Hereford beef is finely marbled with fat, which makes the meat succulent and tender, and gives it a unique, rich flavour. Our Hereford beef comes from a small group of dedicated farmers, and is produced from cattle sired by registered pedigree Hereford bulls. The cattle live outside for most of the year, so they grow slowly. To bring out the best in the meat, our 30 Day Dry Aged Hereford beef is wrapped in muslin and hung on the bone in a carefully-controlled, dry environment. The ageing process makes it even more tender, and develops its characteristic rich, almost buttery flavour.